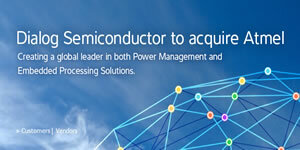 Continuing the recent trend of mergers and acquisitions in the IC market, Dialog Semiconductor has announced it’s deal to acquire Atmel. This is estimated at $4.6 Billion in cash-and-stock, bringing a 43% premium over recent Atmel stock prices. Share your prediction for the next round of mergers and purchases in the thoughts area below. Mergers take place at any time a organization is bought with the objective of combining it with another organization to create a greater enterprise. Acquisitions take place when a organization is acquired by a different organization. Acquisitions include buying the enterprise with cash, stocks, or a combination of the two. Acquisitions can also happen when a organization buys the assets of another organization. Thanks for the clarification on the distinction of mergers and acquisitions.